Gentle, sensitive Cancer in union with the artistic Goat retains its intrinsic vulnerability. At the same time it becomes even more sociable, sensitive to the mood of those around you. She strives to make a good impression and is distinguished by soft, courteous manners. According to the combined horoscope, Cancer-Goat is a kind, sympathetic, pleasant person. He avoids quarrels and conflicts in every possible way, skillfully hides his resentment and discontent. It is repressive and very vulnerable, looking for support and understanding, and criticism is simply disastrous for it. He lives with emotions and feelings, but does not forget about the case: reasonable and practical in everyday life. Despite his mental weakness, Cancer-Goat is actively involved in society. Sometimes it is even too fussy: it is not the lot that fears being, it does not endure loneliness. The benevolent Cancer-Goat is known for all his docile temperament: he easily makes contact, he is ready for compromise. He does not ask unnecessary questions, does not argue and does not impose his point of view. He simply lives as he sees fit, without trying to prove his worth to everyone around him. Surrounding people are often mistaken about Cancer-Goat, underestimate the strength of his character. Although he gives the impression of a weak-willed person, but in fact is quite practical and decisive. She will not openly get involved in the struggle, will try to achieve her by devious ways. He knows how to please people, knows how to turn things in their favor. In addition, Cancer-Goat has a strong intuition, anticipates the danger, does not get involved in questionable cases. The whimsical Goat, under the influence of an overly impressionable Cancer, loses its inherent enthusiasm and optimism. It becomes more vulnerable, suspicious, experiencing a painful dependence on the opinions of others. Goat-Cancer is easily offended, even one careless word can cause a storm of indignation in it. True, this delicate person will not openly demonstrate his offense, but simply withdraws into himself. She is subject to fears and doubts, fears betrayal and deception, and therefore prefers to maintain good relations with everyone around. By nature, Cancer-Goat is a kind, sympathetic and somewhat naive person. This is a reliable partner, loyal friend, readily rushes to help, often sacrificing his own interests for the welfare of others. The main feature of the sign Cancer-Goat — the desire for stability. Indifferent to all material, for him peace of mind comes first. Does not differ ambition, does not dream of glory and universal acceptance. This is not a vain pride or a fiery revolutionary who is willing to fight for his rights to the last. On the contrary, the Goat-Cancer is a conservative, hardly gets used to the new conditions, fears change in panic. Negative attitude to everything that can dramatically change his life. Able to enjoy simple things, with trepidation and love applies to people. Sometimes they even get bored with their care, desire to make life easier for everyone around. Communication with him is only fun. Although sometimes it is capricious — the impact of the unpredictable Goat. Refined Goats-Cancers dream of an ideal love relationship: sheer romance and mutual understanding. Sometimes they become victims of unscrupulous people because of their desire to lean on a strong shoulder. Men and women of Cancer-Goats are looking for a reliable partner that can rid them of fear and doubt. During the period of courtship, they are attentively looking at their fan or fan: one wrong step — fatal offense cannot be avoided. According to the love horoscope,Cancers-Goats are temperamental, passionate people, but they need time to get used to their partner. Cancer-Goat is very attached to his home, for him the best rest is the time spent in the circle of loved ones. This is a real family man: a gentle, loyal partner and a loving parent. Although it has a changeable temper, it can be hot-tempered because of a trifle. 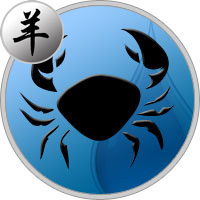 The vulnerable and suspicious Cancer avoids quarrels and scandals in every way, and the unpredictable Goat often provokes a partner to conflicts. Therefore, the second half of Cancer-Goat should not upset and disturb him in trifles: a small misunderstanding can result in a grand scandal. Many consider Cancer-Goat to be a sensitive, sentimental person, incapable of doing serious work. However, he has a good business acumen, reasonably manages finances. It has a sharp mind, responsibility and hard work. Although sometimes too fussing and trying to please the leadership, but only in the interests of the cause. Pedantically and meticulously fulfills his duties, always brings the job started to the end. He can be trusted with any job: the perfect result is guaranteed. Executive, responsible Cancer-Goat does not like to be sprayed, never takes up several cases at once. He does not dream of a prestigious position, although he is fully capable of attaining a high position with the support of his faithful companions. Most often she is content with little, she prefers to work quietly in her place, without being distracted by unnecessary bustle and intrigue. He feels comfortable among like-minded people; professions related to communication are suitable for him. It can take place in the creative field: actor, writer, artist. It is not necessary to wait for decisive actions from the man of Cancer-Goat, he does not like sharp changes in life, moreover, he is afraid of them. Thinks sensibly, to any question comes from a practical point of view, while having a rich imagination and a thin, vulnerable soul. If desired, he could achieve unprecedented heights in his career, but completely devoid of ambition. It is more important for him to live in a comfortable environment. He tries to maintain friendly relations with all people, does not tolerate quarrels and scandals. In love, he manifests himself as a romantic, exquisitely and beautifully cares for women. Cancer-Goat man — a wonderful family man, it gives him great pleasure to communicate with children. This is an understanding and caring husband and father. Fragile, naive Cancer-Goats women literally cry for protection and patronage. They are immediate and emotional, they take criticism seriously. To offend them is very easy, but to gain trust is a difficult task. Cancer-Goat woman brought up, will not scandal and find out the relationship, but will not forgive the lie and betrayal. It is quite an active, energetic person, loves traveling and fellowship, hard to bear loneliness. However, it is difficult to get used to the changes, even a high salary will not force her to change jobs. Also committed to people, will try to keep relations by any means. She is looking for a strong man who can protect her, surround her with love and care.